This guide is for the 2001 Microsoft Windows game. For the 2004 Game Boy Advance game, see All Grown Up: Express Yourself. 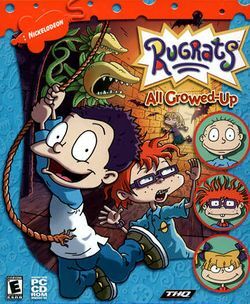 Rugrats: All Growed Up is an adventure game, that was released by THQ for Microsoft Windows on October 21, 2001; as the name suggests, it is the thirteenth title for the Rugrats series, but it is based on the two-part episode of the show where the babies build a time machine and travel to 2011 (which was the future at the time) becoming teenagers in the process (their parents, and Spike the dog, also become geriatrics as a result). When the show begat a spin-off based on that episode, All Grown Up!, it also begat a spin-off game upon the Game Boy Advance, All Grown Up: Express Yourself, in 2004. This page was last edited on 31 August 2017, at 01:39.